With all of the millions of other things you have to worry about over the holidays, the last thing you want to deal with is a bed bug infestation. Bed bugs are frequently referred to as the hitchhiking bugs, as these bothersome critters enjoy hopping from place to person to furry friend and so on. Nobody wants to pick up these pesky hitchhikers, especially during the holidays; however, with nearly 51 million Americans expected to travel this Thanksgiving alone, the chances of area residents picking up bed bugs have increased ten-fold. Holiday travels mean bed bugs will remain a threat to homes in the Winston-Salem area, even during the colder months of the year. Therefore, we have compiled a list of tips for what you can do to avoid picking up bed bugs while on your holiday travels, and to help you identify signs that you may have acquired bed bugs. Of course, you know you can always rely on us at Ray Pest Control to turn bed bugs into dead bugs with our effective, eco-friendly bed bug treatment, should you experience an infestation. 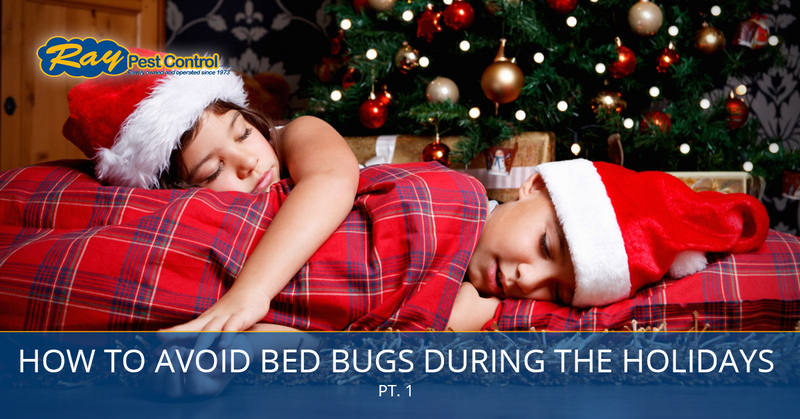 The first step to avoiding bed bugs during the holidays is learning how to identify them. If you know what to look for, you can catch them early on and destroy them quicker! You’ll also know what you’re looking for when inspecting your lodgings and belongings on your holiday travels. Bed bugs are small, wingless parasitic insects with six legs that feed on human blood. They are flat, oval-shaped, and are generally about a ¼ inch in length, yet are large enough to notice if you see one scurry away. They have a rusty-brown color and turn a brownish-red after feasting on human blood. (Yuck!) These nocturnal bugs tend to stay hidden during the day and are more active at night when they come out to feed on sleeping humans and pets. Remember, bed bugs love dark spaces—that means suitcases, boxes, shoes, inside blankets and pillowcases, on walls behind headboards, in folded areas on furniture and beds, and especially in mattresses and box springs. Check out our bed bugs resources page to learn more about these nasty critters. When traveling this holiday season, pack smart. Ensure all of your bag openings and pockets are sealed tightly so bed bugs can’t crawl into those spaces. While you may have closets, dresser drawers, and cabinets to store and hang your clothes in, it’s best to keep your clothes folded and stored in your luggage to protect your belongings. Avoid setting your luggage, especially unzipped bags, on hotel and motel floors; rather, place your suitcases on the little suitcase stands which are usually stored in the main room closet. You can always request additional suitcase stands for multiple bags. It’s best to investigate your room thoroughly for signs of bed bugs before bringing in your suitcases. Bed bugs love hotels and motels, so be sure to inspect the bedding, under the mattress, and in the mattress creases and seams. Shake blankets and sheets vigorously to see if anything scurries away. Check pillows, sheets, and drawers, and don’t forget to check the seams of upholstered furniture in the room. If you’re staying in the home of a friend or loved one and want to check for bed bugs, be inconspicuous when checking the room so you don’t offend your host. If you find signs of bed bugs, notify guest services immediately. You can either ask to be moved to another room or given a refund. The problem is, if one room is infested, it’s highly likely that other rooms or the entire hotel or motel has an infestation. If you think you may have stayed in a room with bed bugs, isolate all of your belongings before bringing them into the home. You can either inspect your luggage outdoors or in a garage. Place all of the items you can dry with heat in a bag. Shake all others out outdoors and look for any falling bed bugs. After unpacking, vacuum your luggage for an added measure of defense. This can help you get rid of any critters that may have snuck into a tight pocket and made it a new home. Vacuum around the area where you unpacked if it was in the garage, just in case any bed bugs scurried away. Throw your heat tolerant clothing and other items in the dryer and blast them with heat for 20 to 30 minutes, as the heat will kill any bed bugs. After drying these items, run them through the wash as you normally would. If you find any bed bugs during this process, kill them immediately to avoid the spread of infestation throughout your house, and call Ray Pest Control right away so we can eliminate those buggos for good! If you think you pick up bed bugs during your holiday travels this season, call Ray Pest Control right away! We will safely and efficiently eliminate these annoying, blood-sucking pests from your Winston-Salem home. Not only will your home be free of bed bugs, but you will also gain peace of mind in knowing that these pests have been removed for good with our effective and eco-friendly bed bug heat treatment. Give our team a call today and we will eliminate your bed bug troubles once and for all. Be sure to tune in to part two of our short blog series to learn how to protect your home from bed bugs when you have guests staying with you for the holidays. Until then, have a happy start to your holidays!